POL: 1492 World Map by Jeanette Crews Designs, Inc. This pattern comes from the book Portrait of Columbus number 139 from Jeanette Crews Designs, Inc. 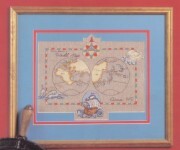 The pattern displays the world map back in 1492, when Columbus sailed the ocean blue. It shows Africa, India, China, and many little islands. It also has a legend at the top of the map, a Lochness monster on the left bottom and the wind at the top right side of the map blowing the ship along that is on the bottom of the map. With Supplies: $25.19 We will ship you the printed design, 19 skeins of DMC Floss & Wichelt 14ct. 18" x 21" Aida (Ivory) to complete your project.